Letter : 4 p. : handwritten, ill. ; 26 x 21 cm. 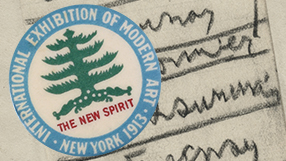 In this letter to his wife, Vera Kuhn, Walt Kuhn describes the pine tree logo for the Armory Show of 1913, the first exhibition of modern art in the United States. Walt Kuhn, New York, N.Y. letter to Vera Kuhn, 1912 Dec. 14. Walt Kuhn, Kuhn family papers, and Armory Show records, 1859-1984, bulk 1900-1949. Archives of American Art, Smithsonian Institution.